An interesting one, this. 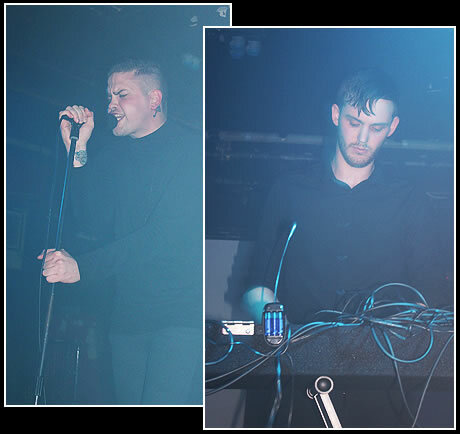 A synthpoppy, EBMish, electro gig up the Electrowerkz - but it's not one of Flag Promotions' Saturday night pre-Slimelight shindigs. 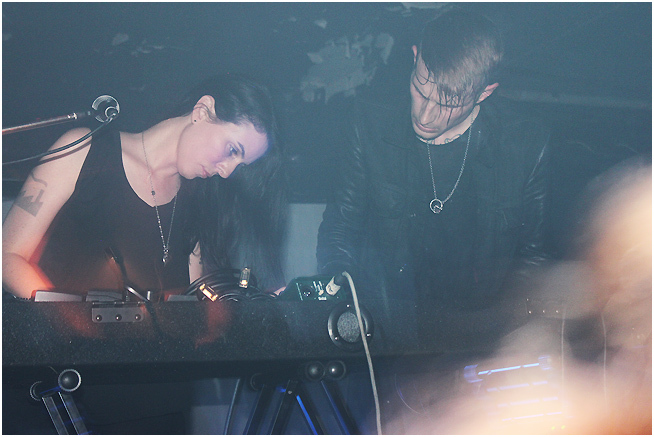 Curiously, because Cold Cave would be right up Flag's street, the band has never worked with London's principal electro promoter. Cold Cave's previous London dates in 2009 came courtesy of left-field noise-arrangers Upset The Rhythm; this one is put together by a new(ish) promoter in town, Parallel Lines. In a move that more or less mirrors the rise of darkly-inclined post-punky bands that emerged quite apart from the goth scene over the past few years, Cold Cave have come up on the rails without going near the synthpop scene. That's odd, given that the band makes music that would fit right in - increasingly so now that the New Order-esque, indie-ish influences of their earlier work, some of which featured decidedly jangly guitar - has now been superceded by a no less eighties, but entirely guitar-free electro sound. There's a point to be made here about the scene versus the non-scene, but I've kicked that one around before. Interesting to find the concept holds good in other contexts, though. Talking of full-on electro sounds, here come tonight's openers, Natural Assembly - a two-piece vocalist 'n' keyboard-controller outfit in the traditional manner. They make a fairly traditional synthpop racket, too, the vocalist emoting mightily over jittery programming while the smoke machine cranks out the fog. Natural Assembly do a decent enough job of their generic electronics, but I can't help feeling I've seen bands like this umpteen times before. In a way they're like the acts that would crop up about lunch time at London all-dayers like Electrofest, ten years ago or more. Decent bill-fillers....but they never moved up. Cold Cave bring a certain reserve to their performance, a deliberate lack of grandstanding but no lack of presence. Wesley Eisold - who is Cold Cave, notwithstanding the assortment of collaborators that have revolved around him over the years - stands amid his swirling electronica like a flagpole in a storm. A keyboard player - who might be Amy Lee, but she's never introduced - is impassive behind the hardware. The music roils and tumbles, a fast, upbeat stream of fizzy electronix, but always with its boots firmly planted in the fertile compost of the 80s synth-garden. Much of Cold Cave's music sounds like a bleaker, blacker Blancmange - the clacking beats, the to-and-fro synth swathes - while Wesley Eisold's vocals are a lugubrious croon, skimming over the music at tree-top height, like crows on a cloudy day. When, on occasions, he breaks his veneer of detached cool, suddenly gets intense, and leans into the crowd with an agonised grimace, as if he's got a message to put across, it's almost alarming. The audience, left-field avant-rockers all, beards and lumberjack shirts much in evidence, seem to dig the Cold Cave dark-end-of-the-eighties vibe, but it does seem curious that although the band are making Slimelight-friendly music in the very venue that hosts the Slimelight, there are no Slimelighters here to hear it. It's odd that the kind of crowd that shows up for Apoptygma Bezerk, or Diorama, or any of the 'scene' synthpop acts that usually pack 'em in have completely blipped over Cold Cave's existence. That's not a problem for Cold Cave, of course: in fact, it's an advantage, because the trouble with being a 'scene' band is that you can never be bigger than the scene. Meanwhile, outside, the sky's the limit. I suspect, if Cold Cave have a factor that might hold them down, it's that all-pervasive eighties influence, beyond which the band never really stray. But It'll be interesting to see how far Cold Cave fly. 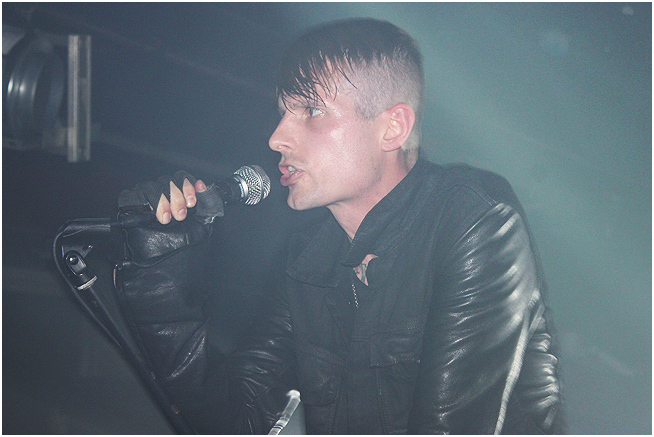 For more photos from this gig, find Cold Cave by name here. Page credits: Words, photos and construction by Michael Johnson. Nemesis logo by Antony Johnston. Red N version by Mark Rimmell.